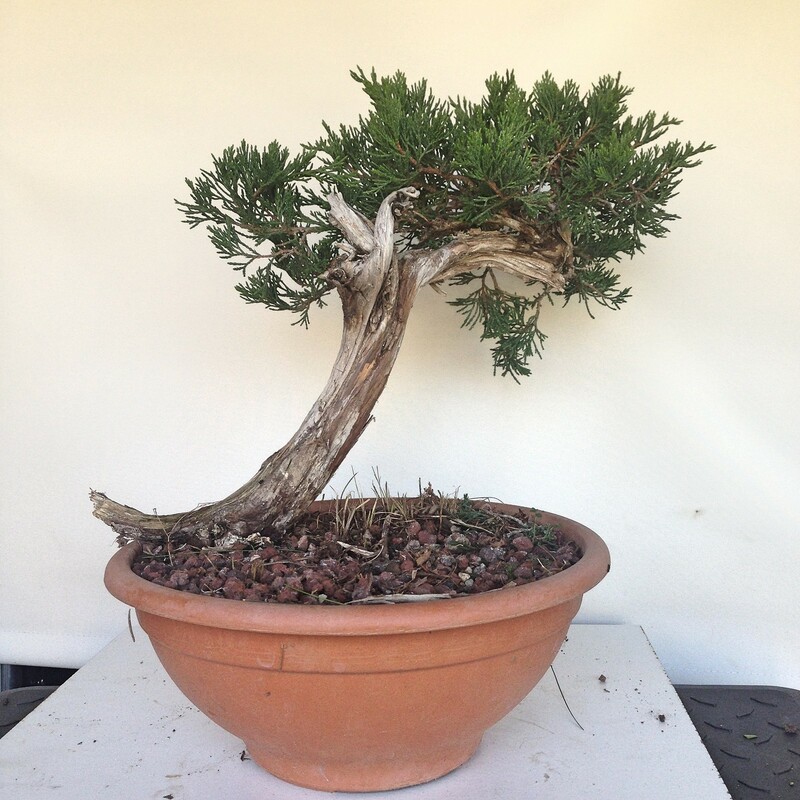 A couple of small Sabina Junipers, on the verge of shohin size that I have been working on for several years. 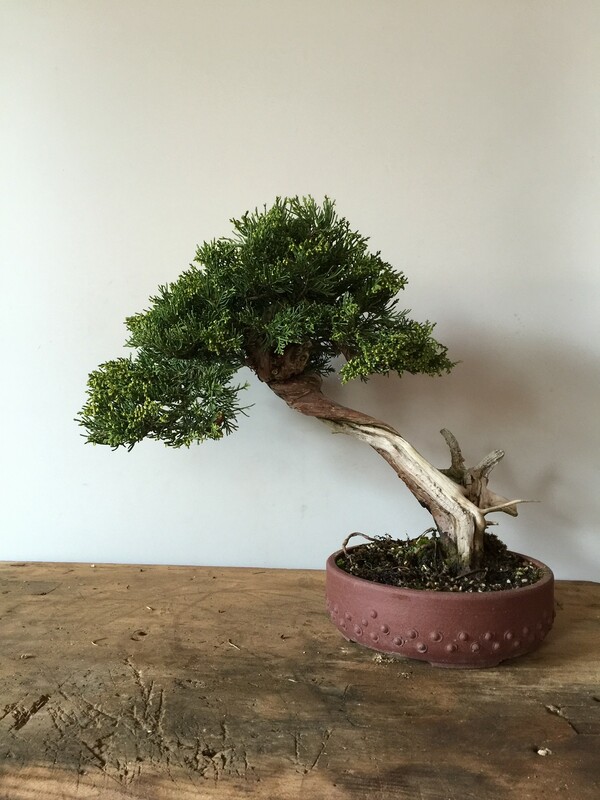 Originally collected in Spain, I purchased them and began the work required to turn a wild collected tree into a refined bonsai. 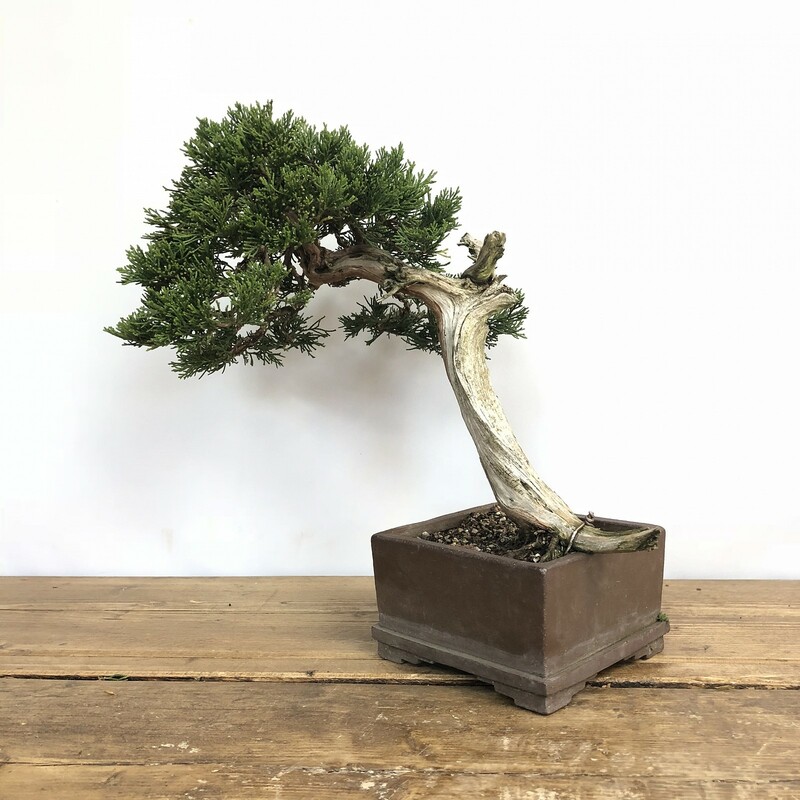 Working with such material, the method employed at Saruyama is to live with the tree for at least six months as it is in the collected state and think about options for potential styling, whilst getting to know the tree and how vigorous it is. 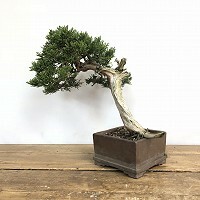 When the time comes, it will be transplanted into a bonsai sized pot at the desired front and angle, with a style in mind. 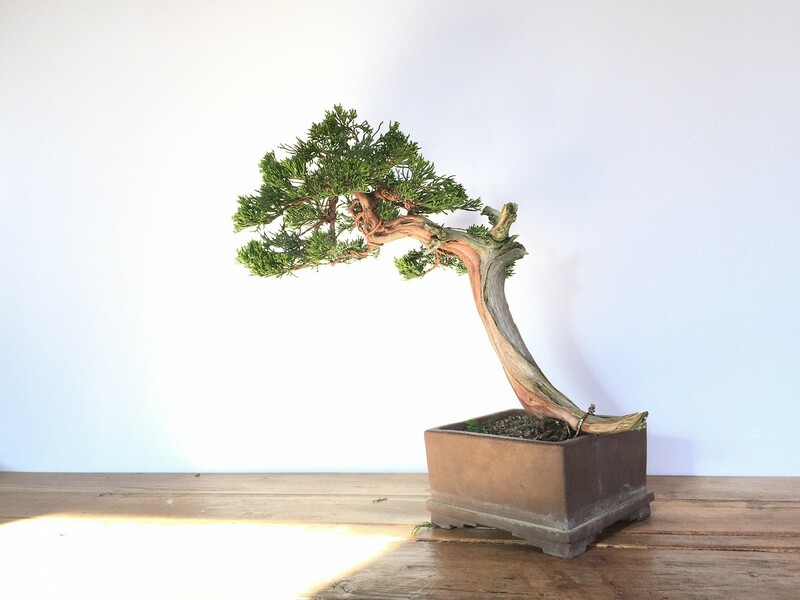 Allowing the tree to recover with a full complement of branches for a period of time gives further time for consideration and as new growth starts to form, unnecessary branches can be removed and growth regulated in the desired direction. 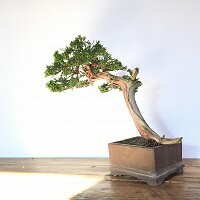 It also gives us a chance to recognise the foliage characteristics and their suitability to long-term bonsai cultivation. This methodical, time effiient approach is paying dividends with several trees. 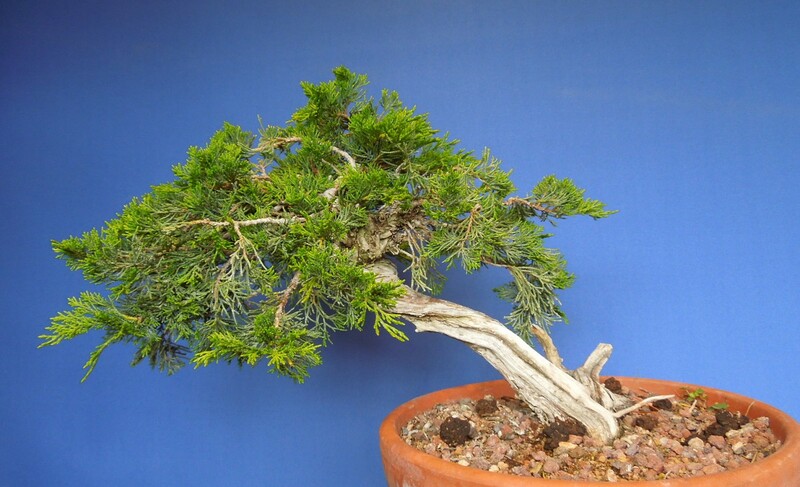 The tree in the square pot is a favourite at Saruyama as it sits quietly, is well behaved and grows naturally into shape. 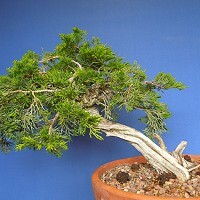 It was potted in a wood fired square pot by Paul Patten in 2013, and there was some debate as to the position of the front, as the lower trunk live vein was not immediately obvious, but after working on the tree during the repotting process, it became apparent that the current front gave the better options for trunk, live vein and dead wood. Planting trees in square pots with the corner as the front is something we are keen on here. The second tree is planted in a round Stone Monkey Ceramics pot and is one of the first trees that convinced me that Sabina can be used as material in the UK. 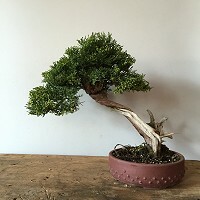 It required very little work in order to get it looking like a bonsai, It overcame the repotting process with ease and needed only two wires to style initially. The right hand side was developed very quickly from a single small shoot and demonstrates the rapidity with which certain foliage types can be styled. There is approximately five years between collection and the most recent pictures, but there is still many years of developing compact foliage pads and developing maturity in the tree.